With a population of 1.42 billion, China is the world’s largest e-commerce market and a popular choice for companies and brands looking for global expansion. According to the China Internet Network Information Center (CNNC), 772 million (53.2%) of China’s population is online – that’s nearly the size of Europe’s entire population! To succeed in China, global brands must adapt their SEO and keyword strategy to embrace Baidu. Baidu is China’s search engine behemoth who holds over 80% of the search engine market share in China. If your digital content works for Baidu, you’ll get access to the largest online and e-commerce population in the world. There are 583 million searches on Baidu per day, so digital content must be adapted to fit in line with Baidu’s unique algorithm and SEO best practices. Although traffic comes from a wide range of sources, search drives 10x’s more traffic to shopping sites than social media. Any China-targeted digital marketing strategy must include Baidu. Given its wide use, Baidu captures more behavioral data and reflects more closely China-based users’ taste than Google. Baidu’s search algorithm has some distinct differences to Google’s. It is vital to understand these to achieve visibility in China. 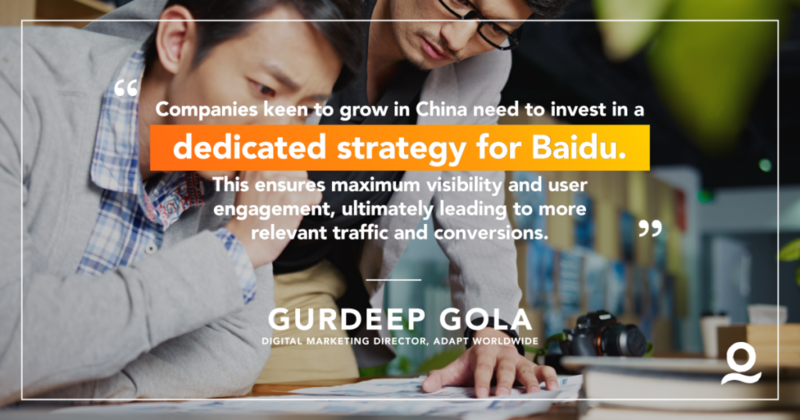 For global brands to drive Baidu-ready strategies, they must work with local and global agencies, leverage local knowledge and use the latest tools to adapt SEO strategy, and monitor the performance of their China-targeted digital marketing, SEO and e-commerce activities. Welocalize and Adapt Worldwide provide clients with metrics on how content has performed on Baidu, using in-house global ranking capabilities and tools. Clients have an advantage over competitors by gaining insightful analysis on how their websites and digital marketing campaigns are performing in Chinese markets. Experts identify the appropriate keywords that target markets are searching for on Baidu, adapt website content accordingly, and provide analytics on how sites are performing. Baidu has ambitious expansion plans, with a goal of becoming a household name in 50% of the world’s markets by 2020. Any organization with plans to expand into Asia have to integrate Baidu into their digital marketing strategy. The future of Baidu will depend on its ability to continue to reflect an understanding of China’s online population, and users in key international markets. Louise Law is Global Communications Manager at Welocalize. For more information on our multilingual SEO capabilities, click here.